At least three-quarters of U.S. households making credit card payments prefer to make one-time payments. Boston, July 27, 2017 – In the past, credit card payments were predominantly made with a check or cash, but consumers are migrating their payment activity to channels such as ACH, biller direct, and banks’ websites. By understanding consumer behavior, credit card issuers have an opportunity to understand what type of customer experience they want to create, what channels to invest in, and where consumer behavior may be shifting from one channel to another. 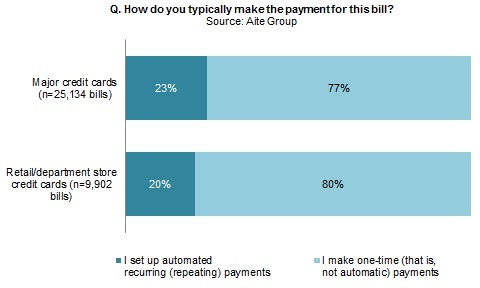 This Aite Group Impact Report sizes the credit card bill GDV in 2016 by payment method and channel, dives into the number of bill payments made by method and channel, and uncovers insights into how all generations—millennials, Gen Xers, baby boomers, and seniors—conduct bill payment activities. It is based on a Q3 2016 Aite Group survey of 2,429 U.S. consumers with a sample of 1,942 consumers who indicated their household paid a credit card bill. This 45-page Impact Report contains 38 figures and eight tables. Clients of Aite Group’s Retail Banking & Payments service can download this report, the corresponding charts, and the Executive Impact Deck.